The Daily Pennsylvanian (DP) published an article titled “Some religious organizations on campus show ‘darker side'” (April 5, 2012). This report included information about Rev. Moon’s Unification Church (UC), commonly called the “Moonies”, which is now using a new name “Lovin’ Life Ministries”. Crescentia DeGoede, the local Philadelphia leader of a UC linked organization called the Collegiate Association for the Research of Principles (CARP), crowed about the results she achieved through her meeting with DP staff. CARP is the UC organization commonly associated with proselytizing at college and university campuses. DeGoede’s accomplishment was also reported by Dan Fefferman, the president of the so-called “International Coalition for Religious Freedom”, which has been characterized as a UC “front group”. Does this seem somewhat similar to the rants and megalomania attributed to Charles Manson, Jim Jones or David Koresh? Rev. Moon also was criminally convicted of tax fraud. He served a sentence in federal prison. And despite numerous appeals that conviction was never overturned or pardoned. Imagine how hard it must have been for the editors at DP to sit down with and defer to the demands of Moon’s church. 1. Publish in their next issue at least a few of ANY letters to the editor our members submit to the DP before Wednesday, April 25th. 2. Publish a revised version of the “Darker Side” article on the Internet, in which they will correct their use of the terms Moonie and deprogramming¦The original version of the article will cease to be available after this revision has been made. 3. Publish a notification of the revision to the “Darker Side” article in print, directing readers to read the revised article online. 4. Publish a follow-up article featuring our contemporary movement in Philadelphia. 5. Communicate and consult with us each step of the way. 6. Read any quotes they intend to use from interviews with our membership to us before they publish them, upon our request. 7. Meet with Dr. Dunning [the professor who was misquoted by them in the original article] to understand his point of view and take corrective action for the misdeeds against him. They will also be encouraging him to write a letter to the editor, which they intend to publish. DP has apparently complied with each and every UC demand. The subsequent article published by DP titled “Creating a new generation of the Unification Church” reads like a “puff piece” based upon a UC press release filled with propaganda, rather than a legitimate news story. “Choosing their religion the way they want to”? The original DP article squelched by UC leaders reported about the “high pressure tactics” used by campus religious groups to recruit Penn students. 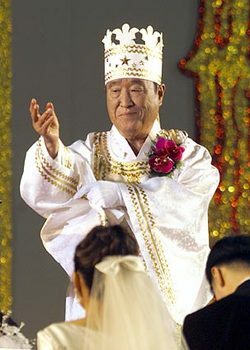 The New Zealand Herald reported about a speech made by Moon and published in 2004 on the Unification Church website. Moon said his followers “must cast aside their friends and teachers, even their parents, and follow the True Parents” (meaning Moon and his wife). “Humanity must mercilessly eradicate all bonds and relationships with the satanic world, not showing even the slightest attachment, and in this way return to the zero point and mark the dawning of a new creation,” Moon added. Some might even observe that Moon’s goal of reaching “zero point” seems like a cryptic allusion to the net result of what has been called “brainwashing”. In fact, the UC has been “convicted of brainwashing” in Japanese court. However, to better understand the background concerning UC problems in Japan read this “Joint Declaration Concerning the Moon Organization (September 26, 1997). Moon’s own daughter doesn’t necessarily disagree. “Those of us – myself included – who were born into this movement or born into this family, we had no choice in the matter”, In Jin Moon told NPR. For more details about what it’s like to grow up in the UC read “Growing up with the Moonies“. The DP deal also included making sure that no copy of the offending article remained online. The article as it was originally written had been archived at the Ross Institute Internet Archives (RI) within the Unification Church subsection. After the DP editor called the previously published article was converted to a news summary, which remains intact within the RI archives. Apparently encouraged by their success with DP UC leaders thought they might try another news outlet in their ongoing effort at information control. RI received an email and registered letter from National Public Radio (NPR) about another archived news report titled “Unification Church Woos a Second Generation” (February 17, 2010). NPR requested that this article be removed from the RI archives. The article was then converted to a news summary, which remains intact within the RI archives. Why did UC leaders take such an interest in the articles archived at RI? This probably occurred because both the NPR report and DP article prominently mention a new name now being used by the UC in North America — “Lovin’ Life Ministries”. Anyone that does a Google search for “Unification Church” will find that the RI subsection devoted to the UC comes up on the first page of results. This means that it is relatively easy to find out that — “Lovin’ Life Ministries” — is really just another name the UC is using to potentially recruit unwary college students. Historically, deceptive recruitment tactics have been a frequent focus of complaints about Rev. Moon and his church. Moon has used literally hundreds of names to promote himself, his agenda and/or pursuits over the years. This name game can be seen as an attempt to obscure the past and/or avoid all the bad press linked to Moon and his Unification Church. It also seems that any criticism of the Unification Church is likely to be labeled “hate language” by UC leaders. But just last week a British newspaper the Mail noted that “Moonie cult leader Sun Myung Moon” has the dubious distinction of being banned from entering Britain. He shares that honor with Louis Farrakhan and the American white supremacist Dennis Mahon. There will also be a panel discussion at the ICSA conference in July titled “Ethics, activism against, and dialogue with cultic groups” moderated by longtime cult apologist Eileen Barker. Ms. Barker once received $25,000 from Rev. Moon to help fund her book “Making of a Moonie” (published 1984). In her book Barker generally minimized the damage done by the UC. Rev. Moon apparently got his money’s worth. Now it seems Barker may yet again yield further dividends. ICSA’s Web site also confirms the planned event. Can cultic groups really change and become ethical new religious movements? Can Rev. Moon and the UC be trusted or is this all just contrived spin control? If and when groups called “cults” do genuinely change this is typically precipitated by a dramatic shift in leadership. And if such a group wants to implement real accountability this is most often demonstrated through democratic reforms and meaningful financial transparency. However, the UC appears to be run more like a family business than a legitimate church organization. There appears to be no meaningful accountability for UC leaders, except to Rev. Moon. But Moon is 92, so it won’t be long now until his children begin carving up his multi-billion dollar business and spiritual empire. The church remains essentially a family business ruled over by a hereditary dynasty. All that appears to be happening is an old Moon is being eclipsed by new Moons.